Welcome to the May Home Depot Gift Challenge! I’m so glad you stopped by today, friends! 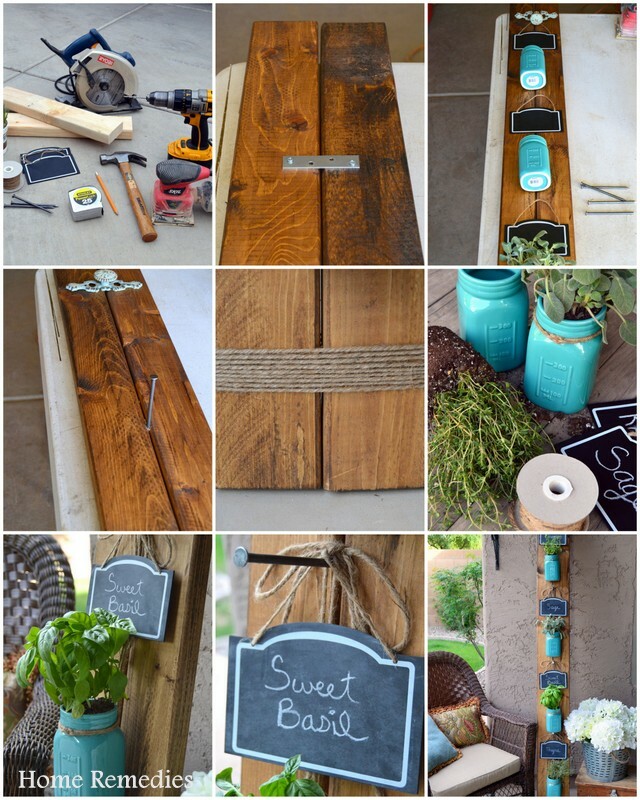 It’s time for another Monthly Home Depot DIY Gift Challenge! 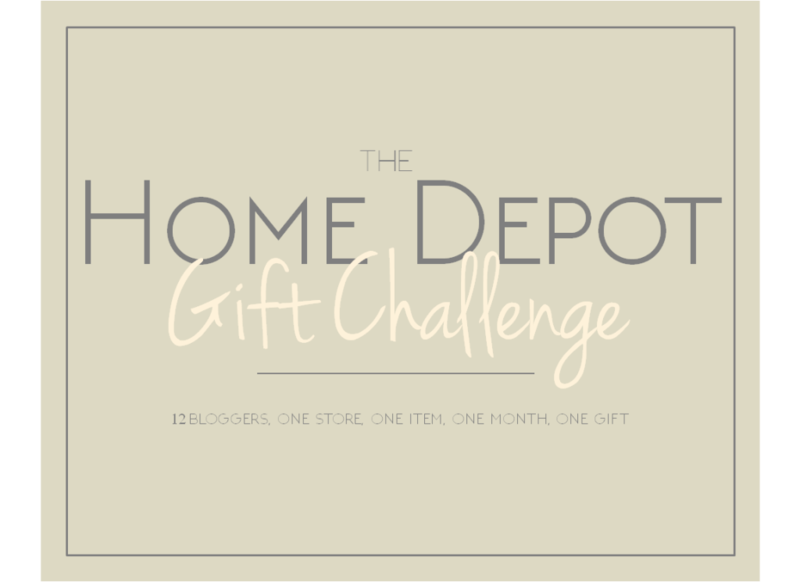 Just in case you’re not familiar with the Monthly Gift Challenge, each month one blogger from our group of 13 will choose an item from Home Depot, then we each make a creative gift using that item. This month it was my turn to choose our item and recipient and I chose the good ole’ trusty 2 x 4. The recipient is a “new home owner”. I tried to think of something useful, but also a bit different than the usual “potted plant” housewarming gift. After racking my brain for a bit, I decided to make my “potted plant” of the edible variety; and came up with this mason jar herb garden. Who doesn’t like fresh herbs? New home-owners don’t usually have the time to start a garden right away, so why not give one as a gift? I like to think of it as the gift that keeps on giving! *This post is not endorsed or sponsored in any way by the Home Depot. We just love the store and its products and thought it would be a fun and challenging collaboration. Securely tie a piece of twine around your mason jars, forming a loop in the back from which to hang your jars. Leave enough length to tie a cute bow (optional). I love that this piece can be used inside or out, and because it leans vertically, it doesn’t take up much space! I hope you enjoyed this Home Depot Gift Challenge! Please make sure you stop by and visit the other talented bloggers participating in the challenge – just click on the pictures below to be taken to each site. This is so pretty! 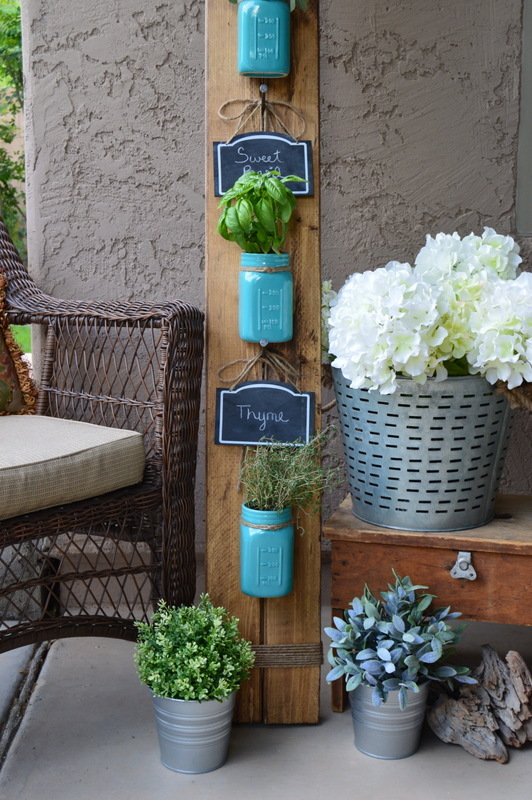 I love the blue jars with the rustic stain and that little slate board makes the perfect finishing touch! How pretty! And, such a space saver!! Thank you Jen! It was so much fun to work on! This is such a great gift idea! So cute! This is the perfect little gift for a new homeowner!! Heck, it’s even perfect for an “already” homeowner!! Ha. I love that it’s vertical, this would be so perfect in our tiny little backyard! Thank you Amanda! I love that it will fit almost anywhere – because things don’t usually stay in one place for very long around here! Amy, I absolutely love this! Thank you Lindi! 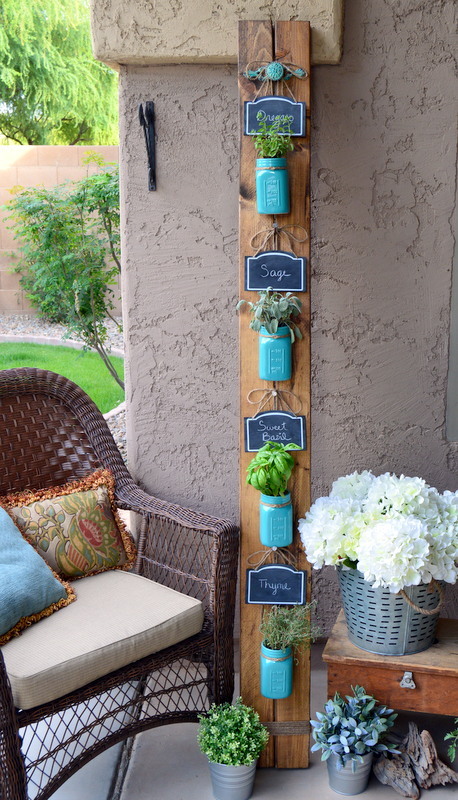 This was such a fun project, and I love that I have fresh herbs on hand! Very creative Amy and cute too I love this idea. Thank you, Kate – I’m so excited to have fresh herbs to use! This is such a fantastic idea! You should sell these bad boys. :) I love the mason jars and chalk board labels! Great work Amy!! Thank you Shannon! That is such a compliment coming from you! This is the cutest summery project!! I love the rustic yet functional aspect! Darling!! Such a great idea Amy! You had be at turquoise mason jars. And everyone needs an herb garden. Awesome! This turned out absolutely lovely. Love that you can move it to various locations inside and outside. Thank you Carmody – this was such a fun project! <3 your herb garden! The color, style and markers all go great together. This would be a great addition to my little patio. Thank you for your sweet compliments! It was a fun project, and the perfect size for a patio! 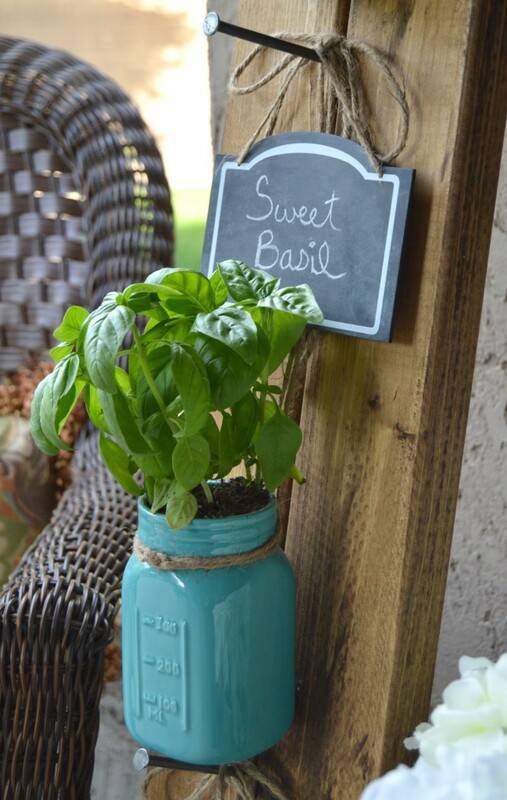 I’ve seen a few mason jar herb gardens but none this adorable! I absolutely love the way you did this, and that turquoise! Thanks so much, Cat! I love the pop of turquoise, too! Thank you Kendra – I had so much fun working on this project! This is gorgeous! I wish I didn’t have a black thumb- I’ve never managed to keep an herb plant alive long enough to use it! I usually can’t, either – we’ll see how long they last! I love them! Great for adding colour all year round. Thank you, Emily! I loved working on this project! This is so cute! I planted some herbs in a pot recently, and this makes me want to dig them up and move them to mason jars! You are too much, Amy! I can’t even begin to praise this…and the color! Perfection! 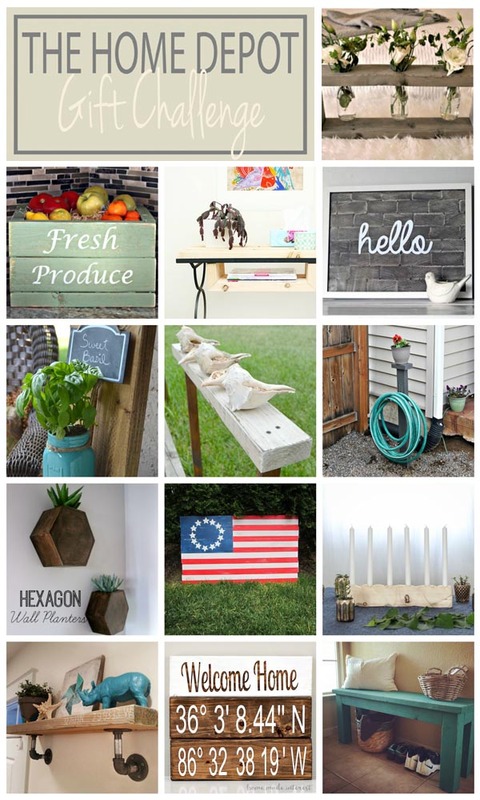 Thank you so much for linking up with Thursday Favorite Things! Thank you for your kind comments, Jas! I love the pop of color the jars add, too! What a fun monthly challenge Amy! I loved all the different items people created although you all started with the same item. How fun! 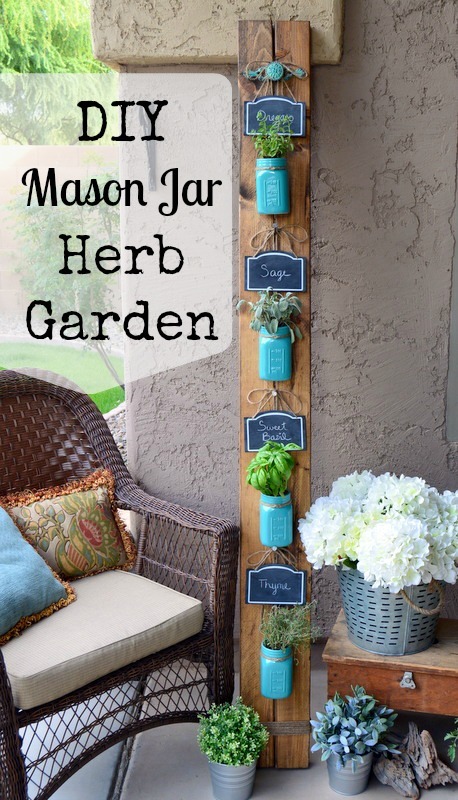 Your mason jar herb garden turned out so well! Really like the chalkboard signs. Thank you for your sweet comments! One of my favorite parts of the monthly challenge is seeing how creative everyone else is! This is so pretty! It turned out great! I love the blue mason jars! I LOVE those blue mason jars. Did you paint them yourself? If so, how did you paint them so perfectly and so shiny? Thank you! I actually found them at Michaels (craft store), already like that! There were several different color choices, but the blue was my fave. Hope that helps!